“I would like them to forget their personal interest, to be interested in the climate”: by this interpellation of the leaders of the world, at the COP 24 in December 2018 then at the international forum of Davos in January 2019 the young activist Greta Thunberg , is has become the icon of a youth that demands a radical change in environmental policies. In August 2018, this 16-year-old Swedish high school student began demonstrating in front of the Swedish parliament, and has been on strike every Friday to demand swift political action against threats to the balance of the planet. By this individual investment and by her speeches lambasting the immobility of adults, she highlighted the lucidity of the younger generations on the risks of global warming. It is no coincidence that his message has received immediate resonance in Australia , a country already suffering the consequences of climate change. Through its mobilization, Greta Thunberg also inaugurates a very particular and unprecedented mode of action. This school strike is both a warning sign about the urgency to act for the climate and the importance given to the school. Is it just a protest? The name chosen “fridaysforfuture” appears more as a call to awareness than a nihilistic act. Nevertheless, Greta Thunberg says, “Why should we study for a future that will not exist soon, when no one is doing anything to save it? Knowledge is the future, but it is through action that we can save the planet. International phenomenon , the “Youth for Climate” markets are increasingly followed in Europe, from Scandinavia to Switzerland , via the Netherlands, Germany, Belgium or Great Britain. 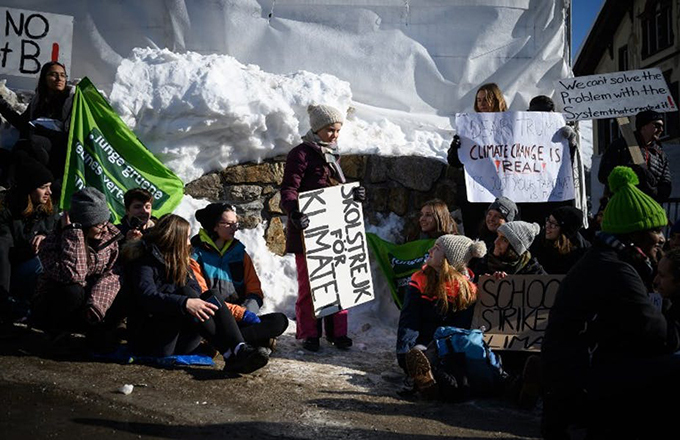 At the same time, schoolstrike4climate , the school strike movement, is relaying Greta Thunberg’s call to a global school strike on March 15, 2019. In France, the marches for the climate are rendered inaudible by the movement of the yellow vests which monopolizes the public debate since November 2018. The French situation can even appear as paradoxical between yellow vests which seem to put forward “the end of the month before the end of the world “and a youth who emphasizes that their future will only make sense if the planet still exists. These strikes question the school institution on several levels. First, it is a mobilization of “young people” and adolescents in relation to their status as high school students. Their action wants to affirm the importance of their role in society: they are the future of our societies and the future of our planet is their future. Then, these protests expose the immobilism or the slowness of the governors on the environmental question. Since 2005, Education for Sustainable Development (ESD) has been integrated into public education programs and has made it possible to understand the complexity of the world in its scientific, ethical and civic dimensions. But this teaching appears well below the urgency of an ecological transition. In November 2010, Unesco published its action plan to tackle climate change through education. But the school strike actions, while taking over the seventeen sustainable development goals published by the United Nations in 2015, upset the planned agenda. Are school strikes, by their singularity, not a lever for real awareness, the school strike becoming the equivalent of a hunger strike, and knowledge a necessity to survive, such as food? It is education as a means of emancipation that is also questioned. How can we make education a tool of social transformation, of individual and collective emancipation? How to reconcile the need to think and act? Beyond education for sustainable development, part of the youth seems to have found its own action to protest and put the rulers face their responsibilities.